The holidays mean many things: family, friends, shopping, decorating and – of course – baking. 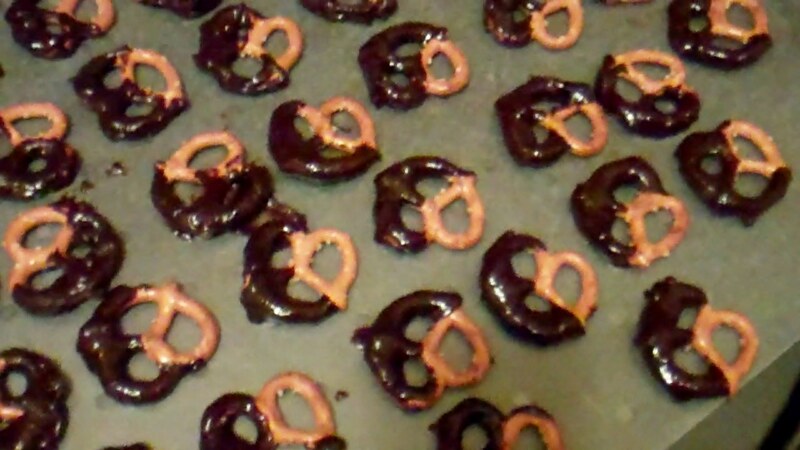 Today I decided to try to make something I’ve always loved – chocolate covered pretzels. I found a few slightly different recipes online and decided to go with one that looked really, really simple: melt chocolate chips and milk together in a bowl, dip pretzels, then you’re done. This sounded foolproof. While it was really easy, it ended up being really time-consuming. I kept needing to reheat the chocolate slightly because it wasn’t keeping its syrupy consistency as I went along. I also made too much chocolate. I’m bringing them to a Christmas Eve at my parents’ house and there will be a lot of people, so I don’t think they’ll go to waste, but I spent about an hour and 1/2 dipping pretzels. Good times. In case you’re interested, here’s the recipe. This made 3 cookie sheets full of pretzels – so know that ahead of time and adjust accordingly. Once the chocolate is melted, dip pretzels into the bowl to coat. Note: I found it easier to hold one of the sections of the pretzel instead of trying to coat the entire pretzel in chocolate. Place coated pretzels on wax paper. Add sprinkles if desired. I was going for a scenic holiday look. He was going for a hunter/prey look. 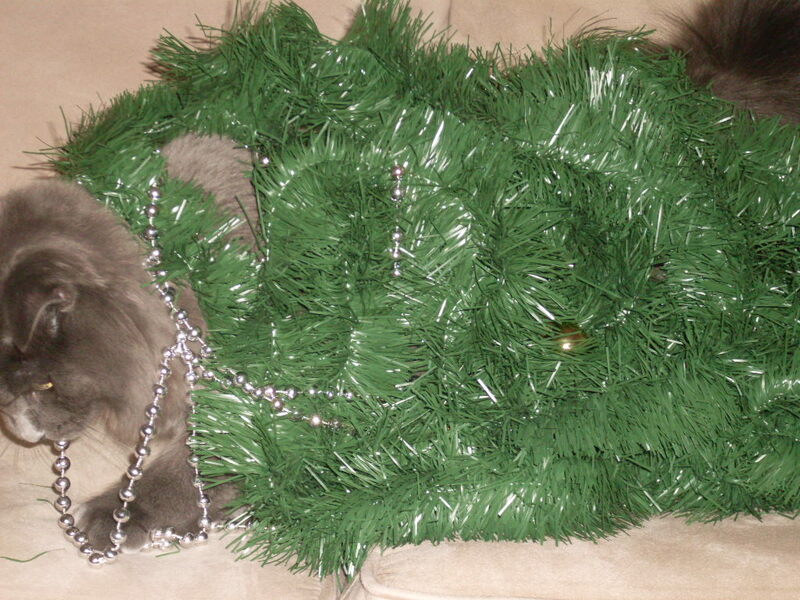 The prey being beads and ornaments. 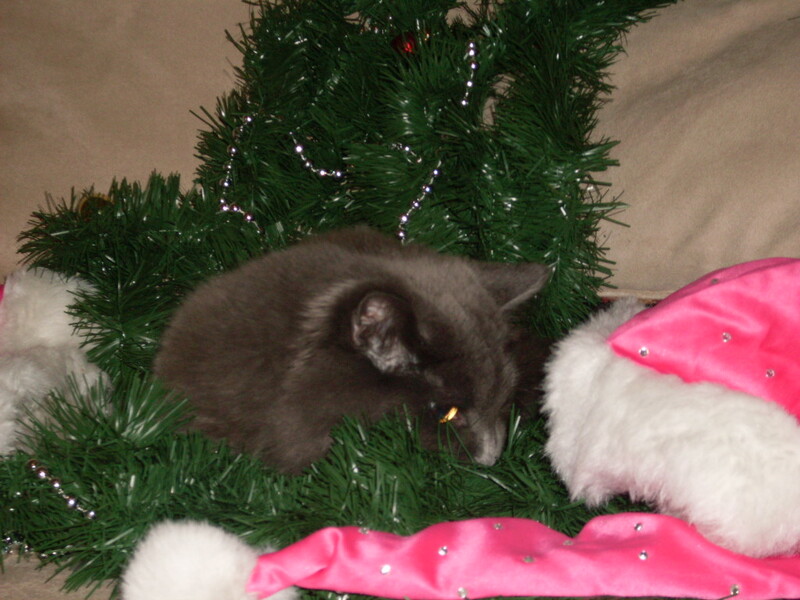 Not surprisingly, he was more than happy to play in the decorations. He was on the hunt. In a small mixing bowl, combine 3 cups warm water, 2 tablespoons vinegar, and a few drops of food coloring. shallow bowl, prepare a second batch of dye — which will provide the swirls — in a darker shade or a different color. Liquid should be 1/2 inch deep. Add 1 tablespoon olive oil. Run a fork through this mixture, creating curlicues of oil on the surface. 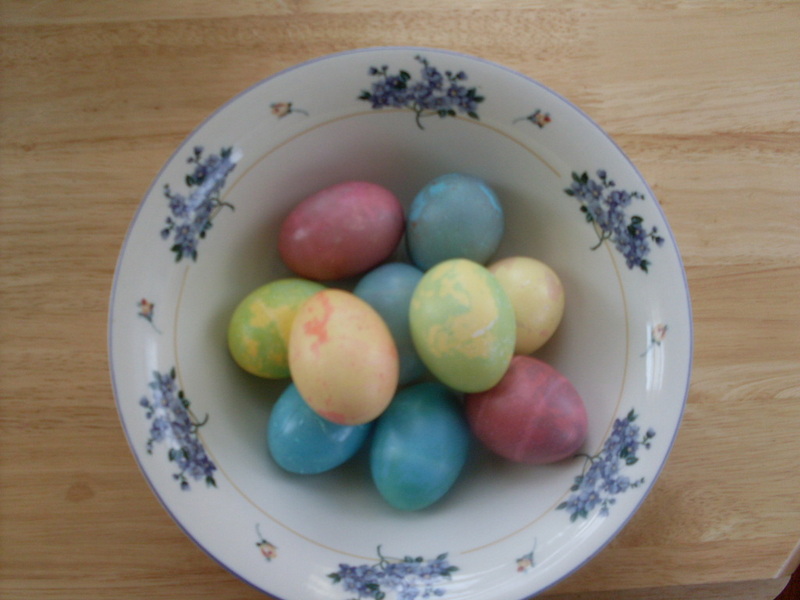 As oil swirls, place dyed egg in mixture, and roll it once around the bowl to pick up oil streaks; remove the egg. Gently pat egg with a paper towel. The trick is to get the right combination of oil in the second round of dying. 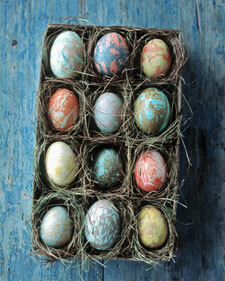 It took me a few eggs to fully realize the oil is what is preventing the second color from sticking. I knew this in the back of my head, but it still took some trials to realize it. Too much oil means the second color won’t stick enough, & not enough oil will make the second dye color overpower the base color. Best of luck! Not to mention the cooking that will take place day-of. I’m baking corn muffins (click for recipe) & can’t decide if it should be done today or Sunday morning. Obviously Sunday morning before my family gets here would be best, but I don’t know if there will be time. They will most likely be made tonight. Looking forward to the wine. Too bad I didn’t think of ordering Toast-its until juuuuust now. 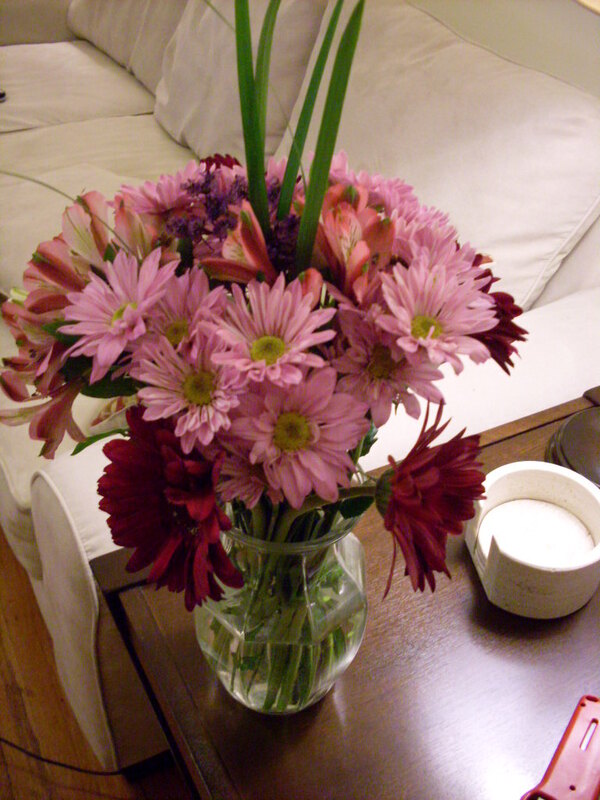 Getting flowers (can’t have Easter without fresh flowers. Yes, I am a dork.) was also on my list, but Sean was nice enough to get them for me. Wish me luck – & Happy Easter! I’m hosting Easter this year (eek!) & am determined to make it special. Typically I spend Easter with my extended family & I can mask my love for decorating eggs & Easter-related crafts with “let’s decorate eggs with the kids!” or “let’s make Easter projects to entertain the kids!” Not this year. This year I can’t hide behind my 5-year-old cousins. I’m not going to let that stop me from sprucing up my apartment for the holiday. With an egg blower, which is available at crafts stores, pierce the top and bottom of each egg, puncturing the yolk; carefully expel the contents. Rinse, and let dry. 1. In a small mixing bowl, combine 3 cups warm water, 2 tablespoons vinegar, and 10 to 20 drops of food coloring. 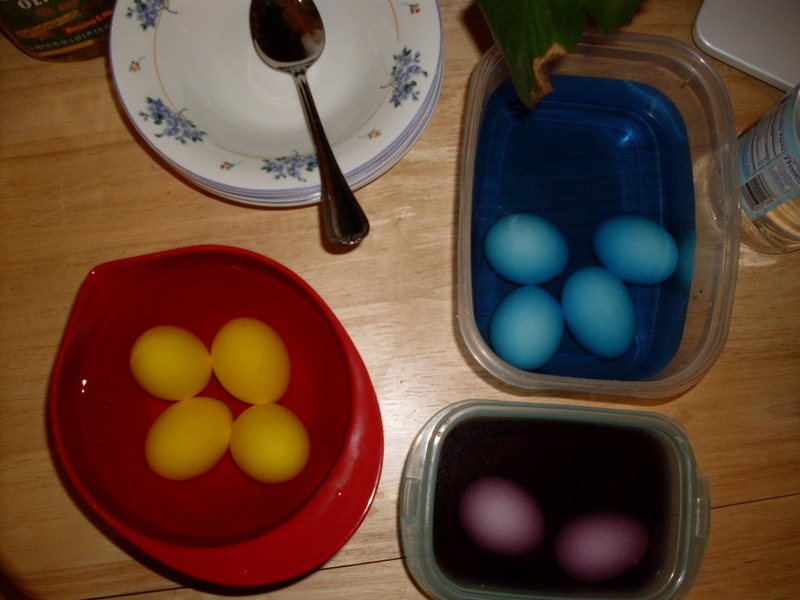 Place egg in dye, and leave it submerged until it turns the desired shade. 2. In a wide, shallow bowl, prepare a second batch of dye — which will provide the swirls — in a darker shade or a different color. Liquid should be no deeper than one half-inch. Add 1 TBS olive oil. Run a fork through this mixture, creating curlicues of oil on the surface. 3. 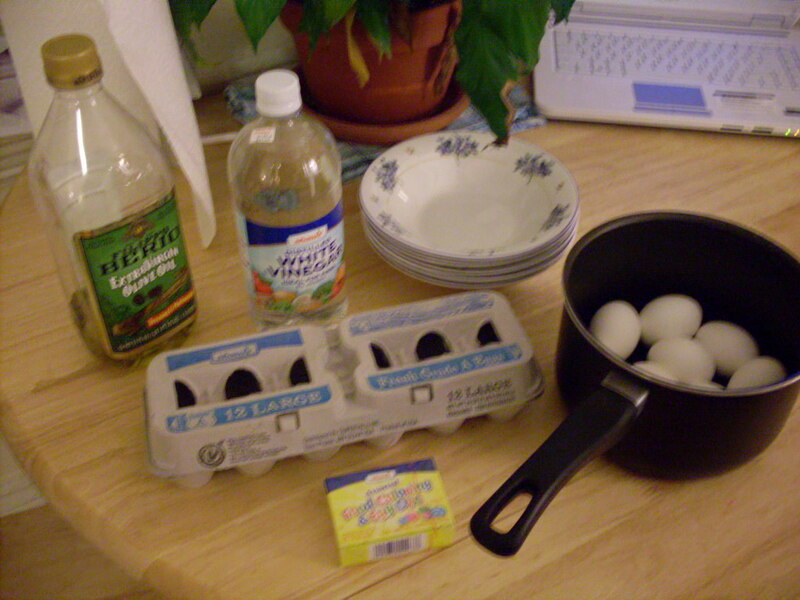 As oil swirls, place dyed egg in mixture, and roll it once around the bowl to pick up oil streaks; remove the egg. 4. Gently pat egg with a paper towel. 5. Let it dry. You can experiment with color combinations: Vary the base tints and the swirls to achieve striking contrasts, subtle shadings, or multihued richness. As I sit here in my living room, listening to Christmas music & having the first real snow storm fall outside the window, I can’t help but feel like it’s Christmas time. 🙂 Christmas of course feels different than it does when you’re 5 years old (or 10…or even 15?) waiting with what feels like endless anticipation of what you’ll receive under the tree. Other things matter more than which Barbie Santa brought you. It’s even nicer to see family & friends whom you cherish. This year hasn’t felt quite like previous years: how is it already Christmas?? While I think I’ve bought presents for more people than normal (nieces this year!) & shopping for people always makes me happy & feels like Christmas to me, it just doesn’t FEEL like it’s almost Christmas. I blame summer. I blame the fact that we didn’t get a real summer – just cold days & rain. Then fall was unusually warm, then BAM last week the frigid air strikes. Then last night the first “storm” of the season started. Anyway…regardless of why it didn’t feel like it was almost Christmas before, I’m glad it does now! With less than a week to savor the feeling, I’m glad it’s finally here. My inbox is flooded with newsletters from different publications every day. Food & Wine, Good Housekeeping, Fitness…the list goes on. 98% of these get deleted before ever being opened. Often times they get deleted because I don’t have enough time to read them & feel they’re not as relevant readying them days later – although it is true much of their content isn’t really time-sensitive. The ones sure to be read are the ones with something specific in the subject line that catches my eye. Immediately I wanted to host one. Next step: figure out who else is on board. Result: hosting a Holiday Dessert Swap (we expanded it) with my friend Katie next Sunday. This way, we’ll all have a variety of desserts to share over the holidays. Genius. I did a little more digging, and & (no surprise) not only does goodhousekeeping.com have great swapping ideas, but so does bettycrocker.com (my friend Meredith actually came up with that idea) & foodnetwork.com. 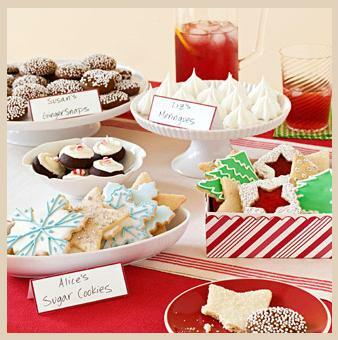 I thought it would also be fun to have a variety of holiday-themed drinks, as well, & found these great recipes on fineliving.com.